The island of Sicily has more vineyards than any other region in Italy. Needless to say, wine is a central part of Sicilian culture and way of life. 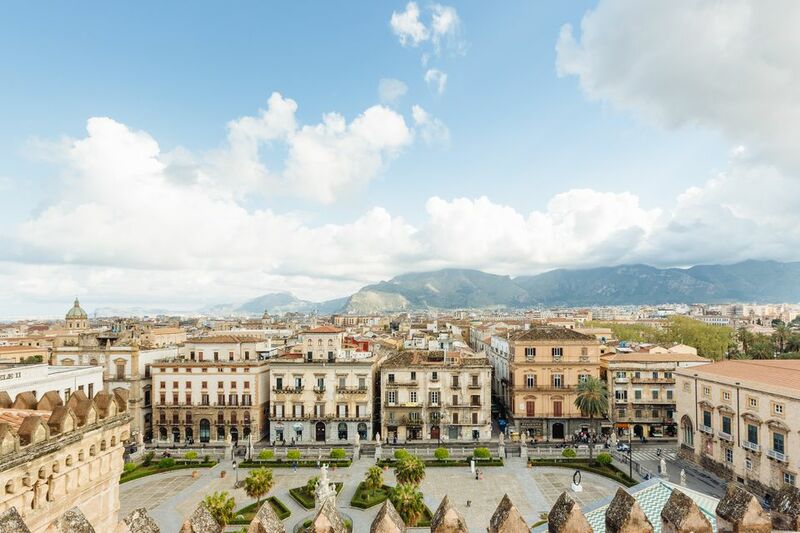 In Palermo, the fifth biggest city in Italy with 1.2 million people, there are plenty of places to taste these famous wines, giving you a sense of the diverse island countryside without leaving your urban base. Here are the top 5 spots to visit on your wine tour of Palermo. There is no doubt that you will find yourself at Piazza San Francesco during your time in Palermo. It is here that the plaza’s namesake church sits, the 13th century Basilica San Francesco d’Assisi. It is also where the original location (since 1834) of the now widely franchised bakery, Antica Focacceria resides. But if you are ready for a drink, turn around and head to Arre Gusto instead. Another stone-walled hideaway, lined with bottles and tiled accents, Arre is a bit more lively, with a great wine selection, but also beer and spirits. A popular draw here is for the daily aperitivo, the Italian tradition of enjoying a lot of snacks along with your sundowner as a warm-up for your late dinner to come. You can stuff yourself with fresh breads, cured meats, cheeses, and olives while you sample a glass of local Cataratto or Frappato. With a name like Hic! La Folie du Vin, it is safe to say there is fun to be had at this hip little wine bar. With art, live music, and a tiny second level balcony that overlooks the bustle down below, Hic! is a place to revel and celebrate. Plus, free snacks and heavily loaded cheese and charcuterie boards can’t hurt. Enoteca Buonivini is in the heart of Palermo, but a quiet outdoor courtyard makes your time here feel far from city life. Take in views of crumbling ancient buildings from your repurposed wood pallet bench or peruse the bottle offerings set out on crate shelving. This is a lovely place to do your wine homework, with a gigantic number of selections at reasonable prices, and a sturdy dinner menu too. Picone Enoteca is old school. This wine shop, the first in Palermo, was established in 1946 and offers an extensive wine experience. If you're looking for a place to really dive into Sicilian wine, this is it — there's a dedicated Sicilian section, of course, as well as a general Italian and international selection. They also have olive oil and pasta on offer, both of which are obvious standouts for the region, along with spirits and craft beer. The tasting element at Picone is equally comprehensive, with a variety of tasting packages to choose from. For example, for 35 Euros you can get the Volcanic Package which comes with a sparkling Nerello Mascalese and anchovy croutons, a Zibibbo served with Bufala ricotta and salmon roe and a Nero d’avola, Alicante, Nocera blend with a sampling of cheese and jam. Another deluxe wine shop that offers extensive tasting opportunities is Vinoveritas. While not quite as old as Picone, this shop still has some chops with a strong following since 2001. The light, modern space has floor-to-ceiling shelves crammed with bottles, from beer to wine to champagne to mezcal. A wide variety of food is available as well, in case you are craving millefeuille of amberjack or lemon octopus salad to go with your glass of Etna Bianco.